The SRE team was increasingly pulled off projects aimed at directly improving the GitHub.com user experience in order to support all kinds of other, internal initiatives. As the number of GitHub services increased, so did the number of teams independently supporting each of them — meaning the site reliability team spent more and more of its time on server maintenance, provisioning, and other tasks unrelated to its main mission. Thus began, one year ago in August 2016, a joint project between Newland’s team and the Platform and Developer Experience teams to evaluate platform as a service solutions. The open source Kubernetes container orchestration engine, developed by Google and maintained by the Cloud Native Computing Foundation, quickly emerged as the leading contender. At the earliest stages of this project, the team decided to target the migration of one of the organization’s most critical workloads: github.com and the GitHub API. It was a deliberate decision, influenced by many factors, said Newland. These included a need for self-service capacity expansion tooling, a desire to increase the portability of this specific workload over time, and a desire for the new platform to persist for years to come. “Given the critical nature of the workload we chose to migrate, we knew that we’d need to build a high level of operational confidence before serving any production traffic,” said Newland. A small trial project was assembled to build a Kubernetes cluster and deployment tooling in support of an upcoming hack week to gain some practical experience with the platform. It was also an opportune scenario for having numerous different teams simultaneously trying out clusters and deployment — a small-scale version of GitHub’s full-scale organizational requirements for the platform. This “hack week” as it was called, was the perfect testing ground, said Newland. It was “a low-risk experimentation environment to play around with how GitHub worked in Kubernetes, and also a good standard of quality for our first investigation — since hack week is all about software that mostly works!” More importantly, however, was the fact that the company’s developers enjoyed having a repeatable environment to test their changes to all necessary subsystems. Rather than establish a set timeline for the entire Kubernetes migration, the team took an achievement-oriented approach. The goal was migrating within existing relative targets for performance and error rates instead of making a hard commitment to any deadlines to finish. The end result was a chat-based interface for creating what amounted to an isolated deployment of GitHub for any pull request. “We’re extremely pleased with the way that this environment empowers engineers to experiment and solve problems in a self-service manner,” said Newland. He explained that the review lab environment, upon internal release, exposed a large number of engineers to a new style of deployment and helped the site reliability team build confidence via feedback from interested engineers — as well as the lack of feedback of engineers that had not noticed any change during continued use. Review lab successfully launched, Newland and his team came back from the end of 2016 holiday break ready to focus on Kubernetes clusters that worked on GitHub’s physical environment and start migrating over traffic. “In fact, several of my own home automations are now powered by Kubernetes,” Newland added. Needless to say, some very interesting adjustments were required. To meet the performance and reliability requirements of GitHub’s flagship service — parts of which depend upon low-latency access to other data services — GitHub’s Kubernetes infrastructure would need to support the “metal cloud” in the company’s physical data centers and POPs. Newland’s team proceeded with caution: “Following no less than a dozen reads of Kelsey Hightower’s indispensable “Kubernetes The Hard Way,” we assembled a handful of manually provisioned servers into a temporary Kubernetes cluster that passed the same set of integration tests we used to exercise our AWS clusters,” said Newland. Building a small tool to generate the certificate authority and configuration necessary for each cluster in a format that could be consumed by GitHub’s internal Puppet and secret systems. Puppetizing the configuration of two instance roles — Kubernetes nodes and Kubernetes API servers — in a fashion that allows a user to provide the name of an already-configured cluster to join at provision time. Building a small Go-based service to consume container logs, append metadata in key/value format to each line, and send them to the hosts’ local Syslog endpoint. 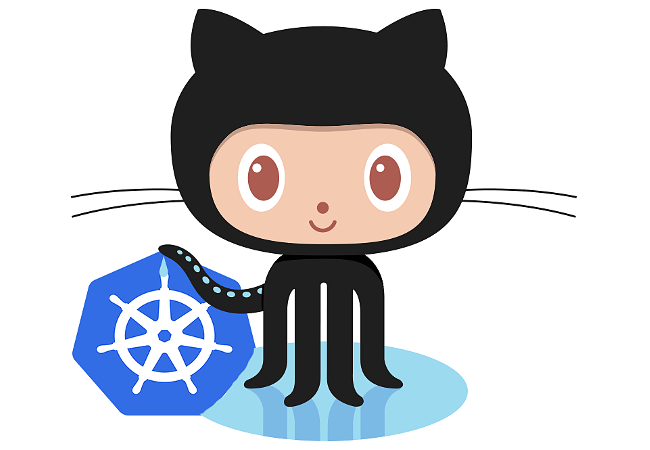 Enhancing GitHub’s internal load balancing service to support Kubernetes NodePort Services. “The combination of all of this hard work resulted in a cluster that passed our internal acceptance tests,” said Newland. Given that, he said, the team was reasonably confident that the same set of inputs (the Kubernetes resources in use by review lab), the same set of data (the network services review lab connected to over a VPN), and same tools would create a similar result. “In less than a week’s time — much of which was spent on internal communication and sequencing in the event the migration had significant impact — we were able to migrate this entire workload from a Kubernetes cluster running on AWS to one running inside one of our data centers,” he concluded. Having created a successful — and stable — pattern for assembling Kubernetes clusters on the GitHub metal cloud, it was time to start easing away segments of the load from GitHub’s front-end servers. “At GitHub, it is common practice for engineers to validate new functionality they’re building by creating a Flipper feature that exposes their new functionality and then opting into it as soon as it is viable to do so,” said Newland. After enhancing the deployment system to deploy a new set of Kubernetes resources to a Github-production namespace in parallel with existing front-end servers — and enhancing the Github Load Balancer to support routing staff requests to a different back-end based on a Flipper-influenced cookie — the team allowed GitHub staff to opt into an experimental Kubernetes backend.